How many nuts can you milk? Almond nut, Macadamia nut, Cashew nut, Walnut nut, Pecan nut, Peanut (not a nut) ~ but don't stop with that, Soy Beans, Rice, Oats, Spelt, Barley, Coconut (also, not a nut, it's a seed), Sesame seed, Hemp seed, Quinua seed. Soak the nuts in your sock for at least 4 hours, up to overnight. Drain. Transfer the drained nuts to your blender, and add the water and sweeteners, if you’re using them. Puree until it’s as smooth as possible. 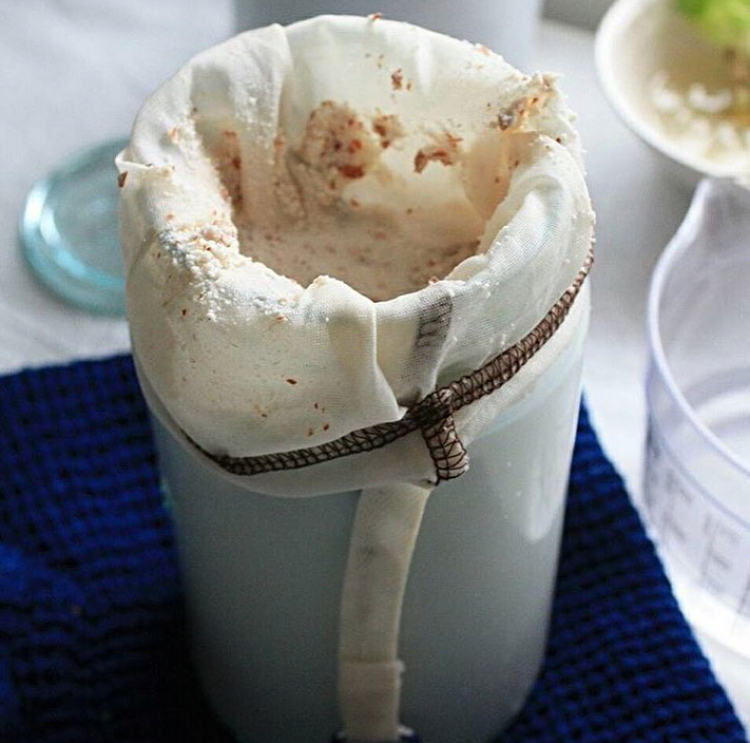 Line your reusable coffee filter into a wide-mouth container and slowly pour in your nut puree. You might have to do this in stages. Pour until your liquids have all passed through your filter. Voila, you have milk!